The weeping cherry tree (Prunus subhirtella) often attains a height of 30 feet with a 25-foot spread, according to the U.S. Forest Service. The branches droop in a classic weeping fashion. Each spring the tree produces abundant pink blossoms that fade to white. Each flower measures 1 inch in diameter, and foliage follows the flower production.The foliage remains a brilliant green from spring through fall. In fall the leaves turn yellow before falling to the ground. Numerous cultivars are available. Most weeping cherry trees are hardy from zone 5 to zone 8. The "Autumnalis" offers ideal winter hardiness down to zone 4, according to Floridata. The popular variety "Pendula" is only hardy to zone 6. The tree prefers to be planted in full sunlight but will withstand partial shade. Partial shade will lessen the trees flower production. Choose a location that offers ample room once the tree has attained full size. Moderate wind protection is ideal. Plant in the spring for the best results. The tree is often overly sensitive when transplanted in the fall, according to the Oregon State University. The tree is normally maintained by allowing the branches to drape all the way to the ground for a stunning effect. Light spring pruning can help the tree maintain its overall shape. Remove any sucker growth that springs from the trees root system. Any suckers that grow below the trees bud union from its root stock will not be true to form like the parent tree. The suckers will not produce a weeping cherry tree. Turf grass that is allowed to grow under the weeping cherry tree will rob the tree of valuable nutrients and water. Remove all grass from the base of the tree and all the way past the trees canopy reach. Mulch the area heavily with 3 to 4 inches of mulch such as bark chips or peat moss. Mulch helps keep the weed growth minimal and also aids the soil in retaining moisture. 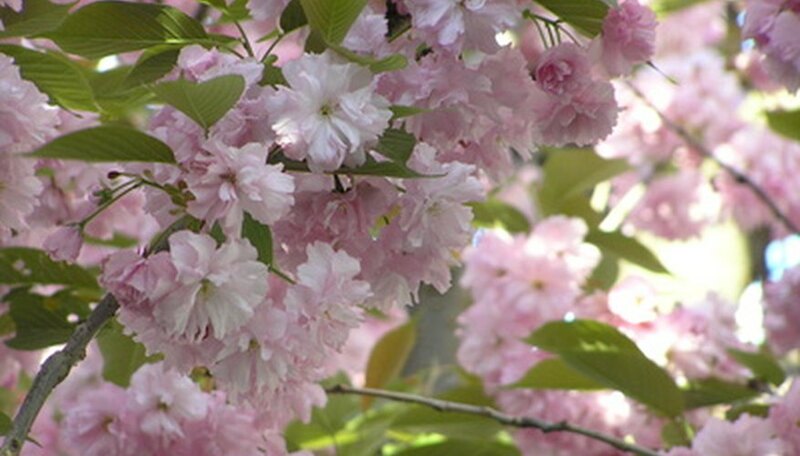 Propagate weeping cherry cultivars by grafting onto standard Prunus species, according to Floridata. Grafted trees normally have a longer lifespan then varieties formed from cuttings. Common pests that afflict weeping cherry consist of aphids, borers, several types of scales, tent caterpillars and spider mites. Treat aphids and spider mites by hosing the insects from the tree using a garden hose. Control scales using horticultural oils. Prevent borers by maintaining a healthy tree. Prune away areas of heavy tent caterpillar infestations. Bacillus thuringiensis controls the tent caterpillar when it is quite small, according to the U.S. Forest Service.